LINCOLN — This article originally appeared in Cornhusker Economics. Cattle producers base major decisions such as calving season on expected economic outcomes which include productivity, input costs, personal capability, individual preferences, markets, and so on. Calving systems are generally categorized into three seasons, spring, summer and fall. Many producers select the spring calving season to maximize the weaned calf weight at the end of the summer grass season. Unfortunately, this increases feeding costs since extra nutrition is needed in the spring, prior to pastures being opened. Also due to the widespread adoption of this early spring calving, the mass marketing in late fall often results in depressed calf prices relative to the rest of the year. Given these observations, efforts to reduce costs and increase prices have prompted more detailed investigations and research focused on moving the calving season to later in the year, such as May or June. While moving the calving season may decrease labor costs and alter market timing, it also changes the matchup between available pasture nutrition and the cow’s needed nutrition level, i.e. during lactation and the breeding season. Choosing the best calving time depends on the producers’ ability to understand their own operation by recognizing both the biological and economic impacts on their production and profitability. Some of the previous economic comparisons of June versus March calving systems have shown that June-born calves weaned in April are more profitable than March-born calves weaned and sold in November (Griffin et al., 2012). These results were due to the available forage during peak periods of production, less harvested feed (hay) needed, size of calf produced, the availability of inexpensive corn residue pasture and the early season calf price premiums. In the western part of Nebraska and other locations, there are producers who have chosen to use a May calving system over a June or March system. These decisions can be made for many reasons, i.e. workload, available labor, size or scale of the operation, or a desire to calve during a warmer part of the year. However, there is still the question of how this choice affects profitability. A head-to-head net return comparison of March versus May calving systems was done via an electronic simulation using relevant historical information and physical and economic factors associated with costs and revenues. 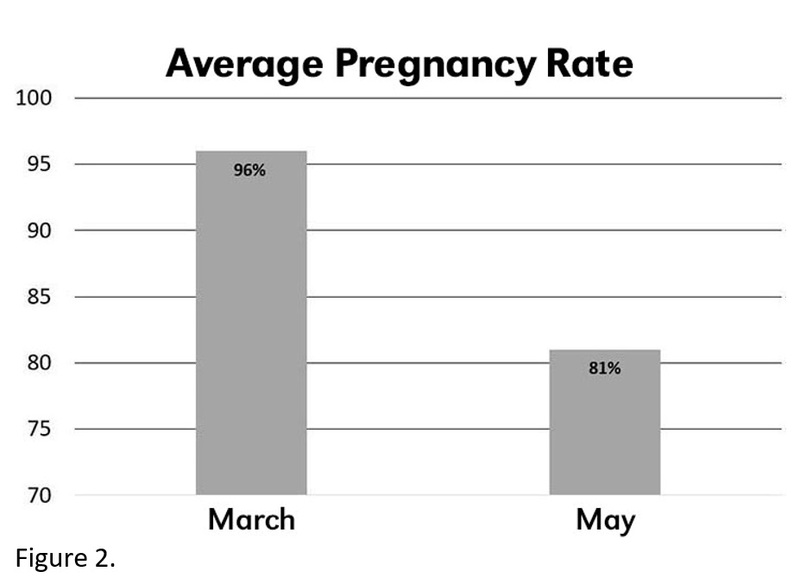 The March versus May comparison utilized three years of data collected at the University of Nebraska-Lincoln Gudmundsen Sandhills Laboratory in Whitman, Nebraska. The biological results for both March and May calving systems were assigned economic factors for nine years (2005-2013). The Nebraska Calving Systems Model (NCSM) was used to capture, match and process all of the relevant prices, costs and relationships for this period. The NSCM was developed by Matt Stockton and others to be used in several of the earlier comparisons of June versus March calving systems. The model accounts for labor, cull and replacement cow costs, breeding costs, productivity differences, feed costs, summer range, winter range and supplementation for both May and March calving systems. In both systems, market prices were average prices including the price differences based on calf weight at the time of sale (price slide), differences by year, and the seasonal price differences based on the time in which the calves were sold. Death and labor costs were similar for both systems, the only difference was the timing of labor inputs. The nine-year average market price received for March-born steers was $162.84/cwt and $148.21/cwt for 4 cwt and 5 cwt steers, respectively. The 4 cwt May-born steers averaged higher at $170.84/cwt, no May 5 cwt steers were produced. This price difference shows that the May-born calves sold for a higher average price per pound than the March calves. This difference is due to seasonal price variation. However, the seasonal price advantage and the price slide difference for May-born calves was overcome by the sheer pounds of production achieved by the heavier March-produced calves. The March-born weaned calves sold on average for $669.19/hd, while May-born weaned calves averaged $617.68/hd. 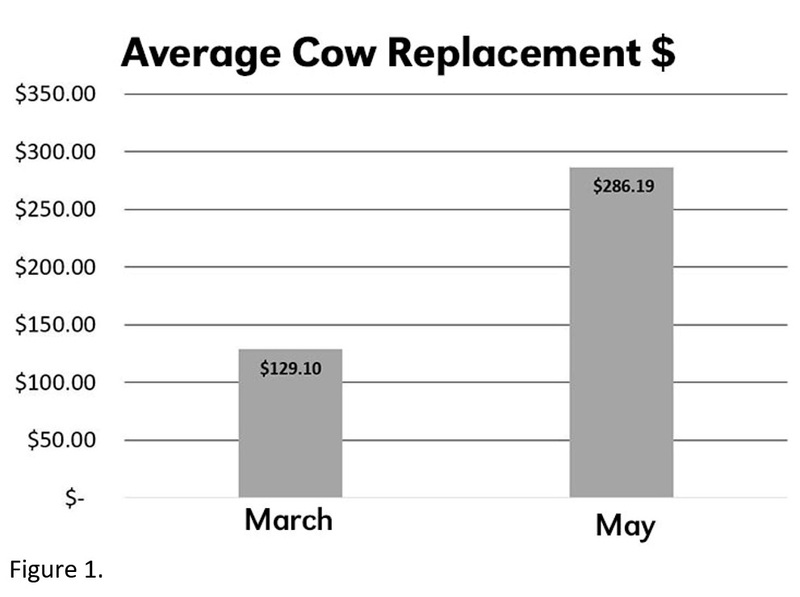 Cow replacement costs for the March systems averaged $185.22/hd whereas the May-born averaged $297.87/hd, an overall average difference of $112.65/hd giving the March system the advantage in cow replacement costs (Figure 1). This was due to both higher replacement rates and the increased cost per head due to seasonal prices for May cows. Average feed costs for the March system were $395.27/pair whereas the May average was $321.40/pair. The final result for the nine years was that March cows annually averaged $25.23/hd profit while the May cows averaged a negative $65.77/hd. However, due to the cyclical nature of the cattle markets over the nine-year period, there were individual years when the May system had higher net returns than those of the March system. This article demonstrates the importance of considering all the factors that alter a calving system’s profitability. Three key factors that altered the economic ranking of the two systems are changes in 1) productivity, 2) production costs and 3) market prices. Productivity changes included lower pregnancy rates (Figure 2) for the May-calving system due to a declining plane of nutrition related to pasture maturity during the breeding season. May cows also weaned calves with lighter body weights. May-calving cow’s production costs had mixed effects. May-calving cows had significantly lower feed costs than March-calving cows, but higher replacement costs. The higher replacement costs were largely due to increased culling rates (lower pregnancy rates), and higher seasonal market values during the replacement period. These results illustrate the value of understanding long- and short-term costs when making a seasonal decision. The market price component has a dual effect with seasonal and price slide effects. If the May-calving cow replacement costs were similar to those of the March-calving cows, the May-calving system would be more profitable than the March-calving system by more than $22/hd. This profit advantage comes from the feed costs savings, seasonally higher calf values and the price slide. Understanding market trends may be just as important as any production trait. When considering a change, producers should substitute their individual expected productivity and price expectations as they estimate profitability differences. Performance and timing drive the outcome. Any change that increases productivity more than its costs, while maintaining price, will have a positive effect on profit and vice versa.